Toothache? Let’s find out why! is always a good idea. 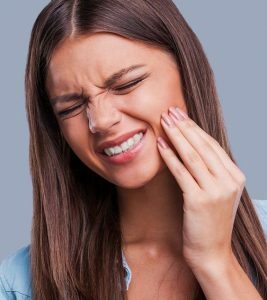 What are the possible causes of toothaches? root of your tooth, which contains all the nerve tissue that keeps your tooth alive. When bacteria enter your tooth root, an infection can make the tooth die inside and may even progress to the jaw bone. center of the tooth and can cause pain. while asleep and be unaware of this dangerous habit, but during the day, your teeth may ache. gum tissue more likely to be inflamed. A bite appliance (night mouth guard) or relaxation techniques can help you conquer bruxism and potentially stop your perpetual toothache! or even tooth decay, the tooth may respond by causing pain. tooth’s nerve, therefore causing pain and even an infection that could compromise your tooth. Impacted wisdom teeth happen when the third molars don’t have enough room to erupt in the mouth, which can cause them to push against the other teeth and cause pain. Typically, impacted wisdom teeth will need to be removed by an oral surgeon, so don’t delay in getting them evaluated if you’re having pain in the back of your mouth! If you’re having a toothache, getting it addressed sooner rather than later is always a good idea. Visit Burns Family Dentistry to see our team, services we provide and what our patients are saying about us. If you want to schedule an appointment, give us a call 910/799-9059. We are accepting new patients and look forward to meeting/helping you with your dental care!